Growing up can be tough. Being a kid is Fantastic and tons of fun but let’s face it, it can be quite tough sometimes too. Kids face a lot of challenges. Kids have fears, anxieties & difficulties. 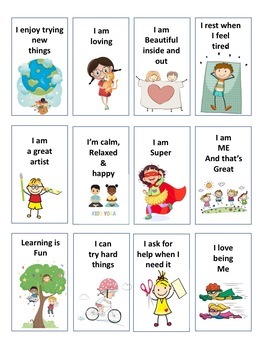 Self-mastery through Positive affirmations or Winning Words as we call them can really help when you put them into practice. The formative years are important and research has shown that our blueprint is developed at a young age. We “learn” our belief systems young and it is “stamped” into our minds as the foundation for the rest of our lives. This is where a lot of our (untrue) limiting beliefs stem from… early childhood. These negative thought patterns CAN be changed later on in life (hence the booming self-help industry) but ….why wait to change them later! It is so important to help your kids establish a supportive belief system NOW by showing them how to create a positive outlook towards life. Even on the “bad” days. 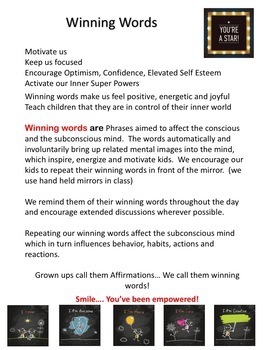 By using our Winning Words daily we aim to teach our kids good values and positive beliefs, which will allow them to develop a higher level of confidence and a good self esteem. Children learn through play and what better game to succeed in than the game of life. 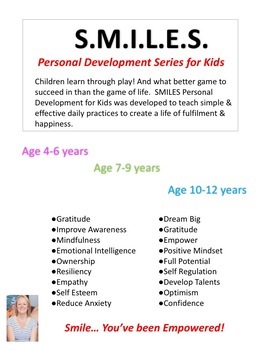 SMILES Personal Development for Kids was designed to teach simple and effective daily practices to create a life of fulfilment and happiness.